The patent pending VersoTable display system is perfect for services at a church or cemetery where a display table is needed for an urn, flowers, pictures or other mementos. The system features a lightweight aluminum table that opens in seconds and supports up to sixty pounds. 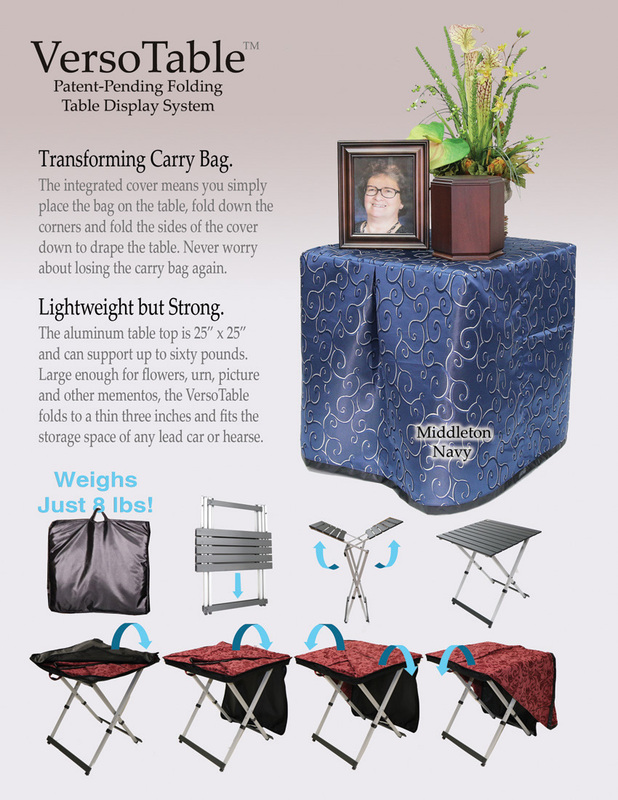 Sized at 25" x 25", the table surface is large enough to display everything necessary for a graveside inurnment. The VersoTable's custom carrying bag holds the real secret of the system: an integrated cover in one of our beautiful fabrics. With other systems, you have to find a place to store the bag when the table and the cover is in use. But the VersoTable integrates the cover into the bag, making it impossible to lose the bag at a church or cemetery. To set up, simply remove the table from the bag and unfold. Place the bag on top of the table, fold down the corners of the bag and then drop the sides of the cover to conceal the table. The cover's one tailored pleat creates a graceful image for the front of the table without adding extra fabric that can blow over the sides of the table on a windy day. This streamlined look also means the entire unit is lighter and less bulky. In fact, once the cover is folded up and the table stowed in the bag, the entire unit weights just eight pounds! VersoTable Cover/Bag is a patent-pending design by Timothy Totten, managing partner and product designer of Final Embrace, LLC. All VersoTables are PROUDLY MADE IN THE USA.